Yikes, is it ever gonna be hot in the western United States this week. 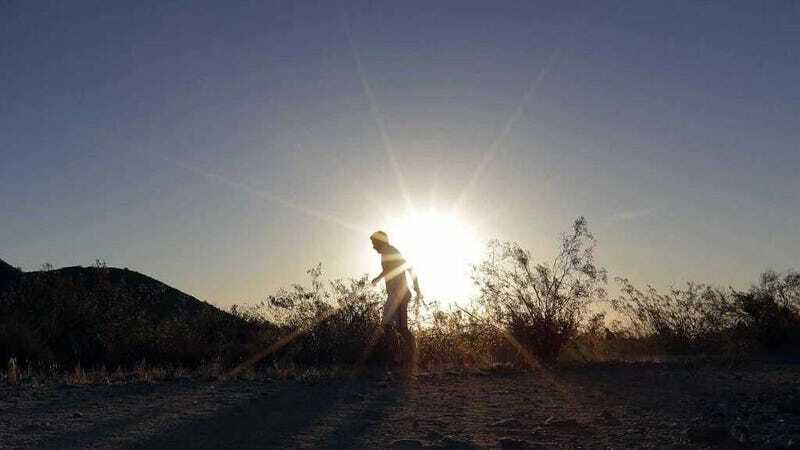 The National Weather Service has issued an excessive heat warning for Arizona, Nevada, and parts of California, where temperatures are expected to reach as high as 122 degrees F (50 C). State and local officials are asking people to take the necessary precautions. Most of the desert dwellers who call this part of the United States home are accustomed to high temperatures, but the dial is about to be kicked up a notch in the coming days. Excessive heat is projected for portions of Arizona and Nevada, and throughout the 450-mile (725 km) length of California’s Central Valley. In Phoenix, it could get as hot as 120 degrees F (48.8 C), and Palm Springs is projected to reach a whopping 122 degrees F (50 C) by Wednesday. Similar temperatures are expected across much of the US southwest, prompting a public health hazard. Indeed, it’s already uncomfortably warm in the southwest. This past weekend, temperatures reached a staggering 124 degrees F (51.1 C) at Death Valley National Park. A dry, high-pressure system is currently lingering over much of the area, resulting in the excessive temperatures. In addition to the heat, meteorologists are predicting thunderstorms and strong wind gusts. Cities are bracing for the heat, with jurisdictions setting up cooling centers and water stations. The public is being advised to seek relief in air conditioned dwellings, and (very importantly) to stay hydrated. It’s tempting to attribute this latest blast of heat to climate change, but we won’t know for certain until patterns are spotted in the long term data. But if the climate models are to be believed, this could be the start of an upsetting new trend. Indeed, this latest heat wave is not something to be trifled with. If you live in the US southwest, please be sure to take all the appropriate precautions. The U.S. Southwest Could Soon Experience Decades-Long "Megadroughts"